Next-gen LiDAR sensors for autonomous vehicles. Platform for predicting the ROI of place-making improvements, for cities & real estate developers. Online training platform for a company’s employees. 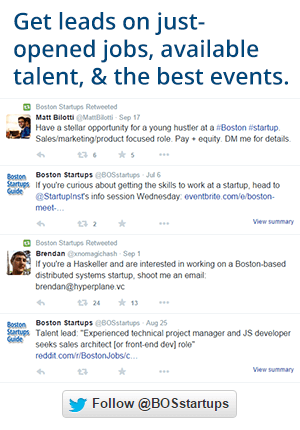 Twitter's a great resource for job-seekers, especially in Boston's startup scene. Some job opportunities never make it to being listed on a site. And I occasionally retweet talented folks looking for work, so make sure you're following me to get on my radar.